Every once and a while I love to make fresh pasta. It's fun to turn some Italian cooking music on, toss some flour in the air and roll up my sleeves. The best part is that the kids join in and help. All the recipes that I've ever tried always seem to turn out a little too "eggy" for my kids, so I wanted to create something that was a little more mild. By adding a little water, I was able to get the same homemade pasta, but something that was a little more family friendly. Mound the flour on the counter and then creating a well (my daughter calls it a volcano, whichever, maybe wel-cano). Crack eggs into the well, then add the olive oil and water. With a fork mix the liquids and start incorporating some of the flour. 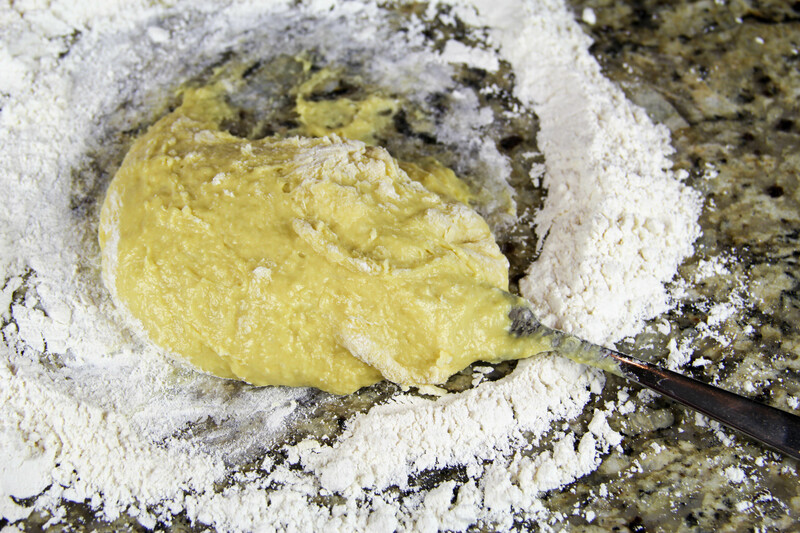 Try to do a little at a time so that it doesn't mix too fast, which can cause it to turn into a lump of dry, hard dough. And make sure you get the dough that's starting to stick to the counter. Mix until it comes together into a ball, and does not stick to your hands. 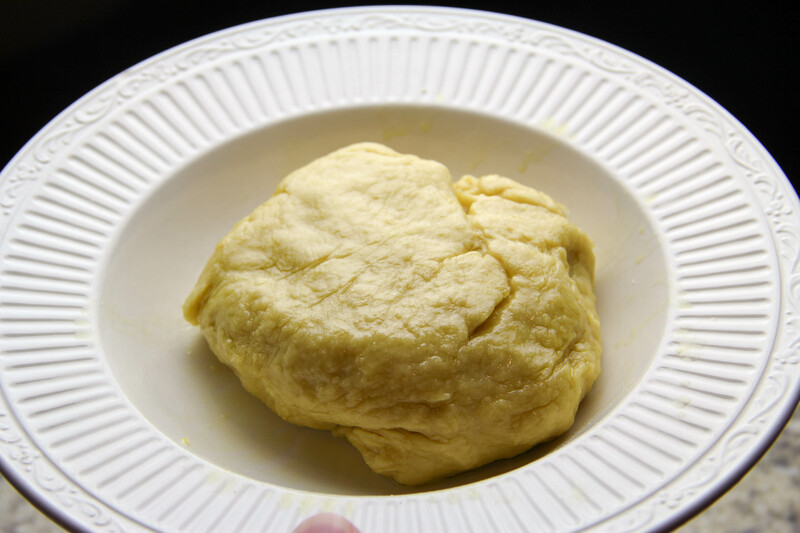 Start kneading the dough and add flour to the surface as needed. After kneading for a few minutes, place in a bowl and cover with the 1 TB of olive oil. Cover the bowl with plastic wrap and let sit for an hour (at least half an hour). Separate the dough into 2 sections. Take the 1st section and roll out on a floured surface. I find it's best to roll a little, flour the pasta, turn over and roll more. I usually roll a couple times per side, flour the pasta each pass. Adding the flour helps to keep the pin from sticking, but also from the dough sticking to itself when you cut the pasta. 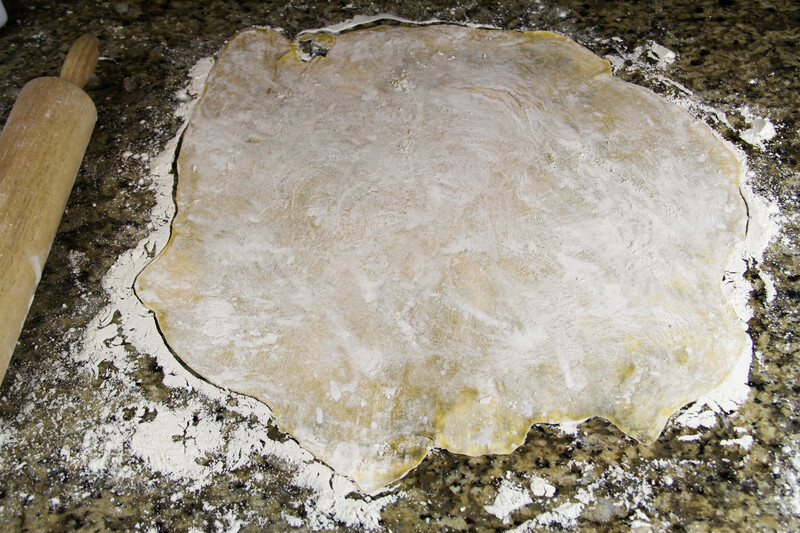 Once the pasta is flat, start at the end and start rolling the dough into a log. Cut the pasta in ¼ inch sections (or however wide you want.) Unravel the pasta. Dust with a little flour to keep from sticking. I usually put mine on a cookie sheet to spread it out. repeat with the second section of pasta. Cook the pasta in 2 batches. Add the pasta to salted, boiling water and cook for 4 minutes (the pasta will float when done.) This next part is optional. I like taking the pasta from the water into a pan with 1 TB of melted butter. I saute the pasta for just a minute or two over medium heat.